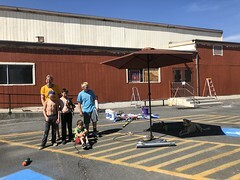 This is a regular Kidical Mass family bike ride, EXCEPT there will be some photo- and video-taking for our friends at G&O Family Cyclery to use on their website and in an upcoming commercial. No need to have any particular type of bike from any particular shop. Meet at G&O Family Cyclery (8554 1/2 Greenwood Avenue N, Seattle, WA 98103) at 10:00 a.m. on Sunday, June 19th (a.k.a. Father’s Day). We’ll ride 2.5 miles along quiet streets, Greenways, and the Interurban Trail to Bitter Lake Playfield for some playground time. The wading pool isn’t open yet, but perhaps I’ll bring my bike teeter totter (note: only works for kid bikes) since empty wading pools are pretty good teeter totter spots! Seattle Kidical Mass rides are presented by Familybike Seattle. Familybike Seattle is a 501 (c)(3) non-profit that decreases barriers to bicycling for families of all income levels. We believe that biking as a family increases our individual, family, and societal quality of life, while at the same time moving toward sustainable lifestyles and communities. Kidical Mass is a fun, safe, easy-going, and law-abiding family bike ride for kids of all ages. It started circa 2008 in Eugene, Oregon, and has since spread to other bikey burgs, like Seattle! Our monthly group rides include a nice mix of experienced cyclists, and folks just getting started. 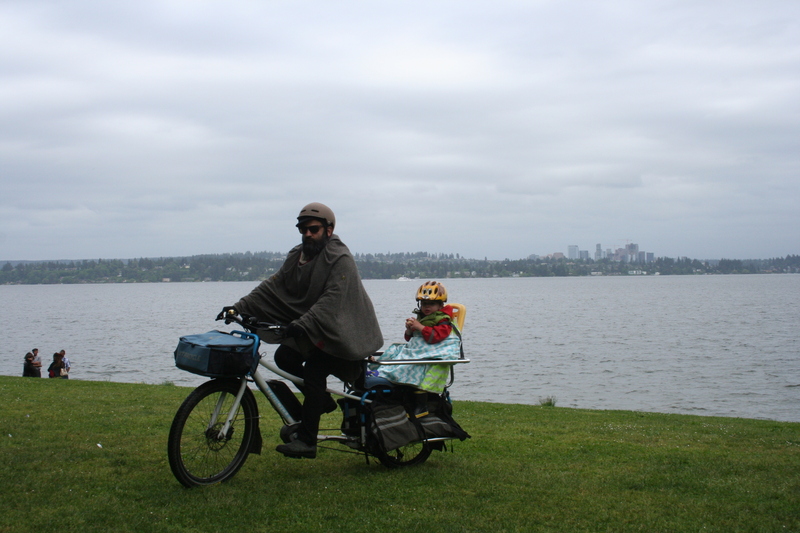 We hope to educate bike-curious parents about ways to bicycle with children, help kids learn to ride safely in the city, and increase the visibility of family biking on Seattle streets. Kids are traffic too! All manner of bikes and high-occupancy velos are welcome. Some Kidical Mass ride leaders are Cascade Bicycle Club volunteer ride leaders. Cascade Bicycle Club is the nation’s largest statewide bicycle organization and serves bike riders of all ages and abilities throughout the Puget Sound region and across Washington state. Cascade’s mission is to “improve lives through bicycling” through many programs including free group rides. For Kidical Mass rides led by Cascade ride leaders, all participants are required to sign a wavier and wear a helmet. Note: this particular Kidical Mass won’t be a Cascade Bicycle Club event due to the promotional nature of it. Therefore no waviers and related requirements.